Nobleboro touches Duck Puddle Pond, Pemaquid Lake and Damariscotta Lake where camping and fishing are greatly enjoyed. Nobleboro is a predominantly residential community while retaining its rural character. Many descendants of the early settlers continue to live here. There is a large cluster of homes in Damariscotta Mills. Some of them have been there for more than 100 years. The same is true of Nobleboro Center. Many of these homes are original homestead of the town’s first citizens. 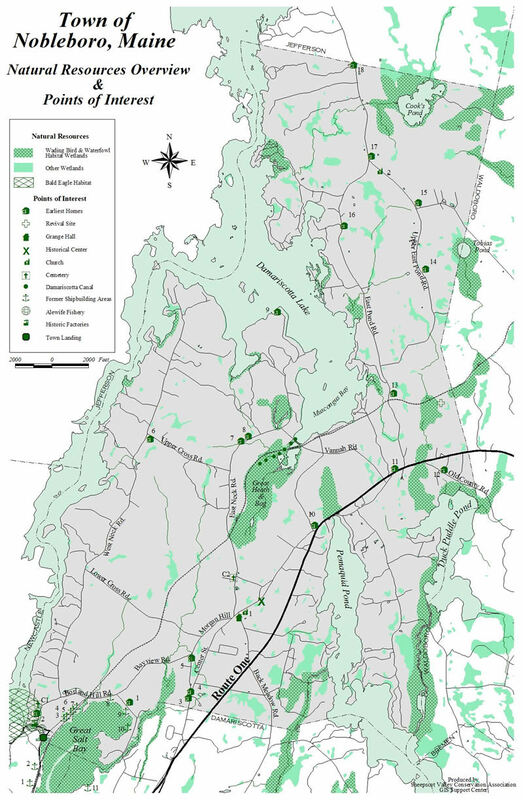 In 2002, the Nobleboro Conservation Commission in cooperation with the Nobleboro Historical Society developed a Walking-Driving Map of the town. These are available at the Town Office and through the Nobleboro Historical Society. This brochure and map guides you through the town’s historical and environmental areas. Numbers on the map correspond to numbers and symbols in the narrative. Most of the areas can be seen from the roadways. In cases where the areas are located off the road, access can be made easily on foot. Follow any of these links to find information about Nobleboro Historical sites. The numbers on these pages refer to the locations shown on the Walking-Driving Map.